Since January 1, 2015 Yashow market is closed due to renovation. We'll update the article with more information as soon as we know more about the re-opening. 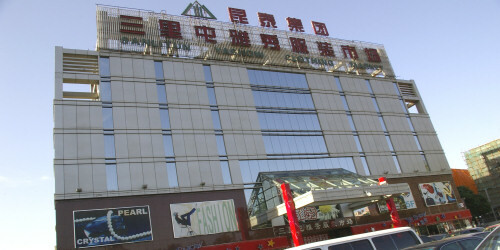 This market is situated at Sanlitun, the popular bar street in the east of Beijing. If you have been to the Silk Market, you will recognize the concept. Shoes, suitcases and handbags are sold in the basement. On floors one, two and three there are mainly designer's clothes, and on floor three there is also a tailor with a large selection of silk and suit cloths. This floor also holds some children's clothes and silk products. Floor four has a little of everything. Mp3/Mp4-players and other electronic goods, watches, pearls and jewellery, some tea and tea-related stuff, Chinese ornaments and quite a lot of toys. A small beauty salon is squeezed in along one of the walls, offering you to get your eyebrows trimmed, your nails painted and your feet massaged. The prices are low and so is the quality, but after the long walk up to this floor, it can still be relaxing. Since this market is mainly visited by foreign tourists, its salespeople speak English pretty good.